Last year, I read a heart-breaking story about a ten-year-old child and his mother, found dead from Carbon Monoxide Poisoning. Carbon monoxide is an invisible, odorless and deadly gas that can be produced by any fuel-burning device, such as a furnace, boiler, stove and, of course, cars. Known as “the silent killer,” CO poisoning is the number one cause of accidental poisoning deaths in the United States. This little boy and his mother were staying at a hotel with an indoor heated pool. They were in the room above the pool and never woke up. It makes me sad to think about that story, or to share that story today, but it has stuck with me and probably always will because it was preventable and because I have kids that age. Since hearing of that story, I have started taking our own portable CO alarms with us on every vacation. It scares me because you don’t know about the CO poisoning until it is too late since it can’t be seen or smelled. The symptoms mimic those of many other illnesses, including nausea, headaches, dizziness, weakness, chest pain and vomiting. In more severe poisoning cases, people may experience disorientation or unconsciousness, or suffer long-term neurological disabilities, cardiorespiratory failure or death. CO alarms are the only way to detect this poisonous gas, yet nearly half of Americans report not having CO alarms in their homes. According to the Journal of the American Medical Association, carbon monoxide poisoning is the number one cause of accidental poisoning in the United States and is responsible for an average of 450 deaths and more than 20,000 emergency room visits each year. The National Fire Protection Association (NFPA) recommends that carbon monoxide (CO) alarms should be installed on each level of the home and in a central location outside each bedroom. To put this in perspective, the average-sized home in America – a two-story, three-bedroom house – needs a minimum of four CO alarms. Make sure alarms are installed at least 15 feet away from sources of CO to reduce the chance of false alarms. Did you know that Carbon Monoxide incidents go up in the winter? Did you know that studies have shown children between the ages of six and ten wake more easily to a voice than to the traditional audible beep of an alarm? I think that is a very significant point because I want our kids to wake up immediately if there is a danger in our house. If you have young children, trying using a smoke and CO combination alarm. First Alert has one that features both voice and location technology called the PRC710V. NEVER leave your car running in an attached garage EVEN if the door is open. CO emissions can leak into the home. NEVER use charcoal grills, camp stoves, generators, or other similar devices inside. Run kitchen vents or exhaust fans any time the stove is being used. If you have to use an electric generator, be sure to have it at least 15 feet from your home. -Have all of your fuel-burning appliances checked regularly, by a professional, to be sure you don’t have any CO leaks. 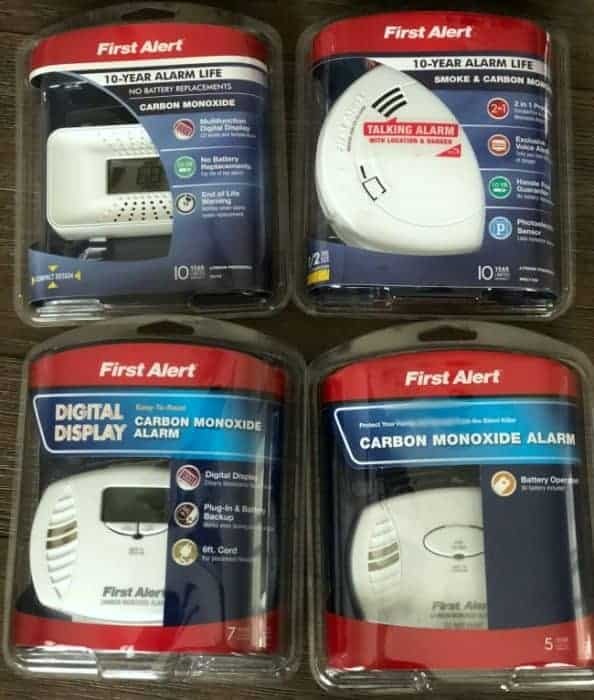 Check that all of your CO alarms are working correctly (check batteries, be sure they are plugged in all the way, etc…) If you have a CO alarm like the CO710 or the PRC710V, they have a 10-year sealed lithium battery that never needs to be changed for the life of the alarm. It is still essential to test it, even though you won’t need to replace the battery. Do you want WIN this prize pack (below)? The fact that I found interesting and scary is the same as you. Having 3 boys, 9, 7 and 13 months it is very alerting. After reading this I’m double checking all of the safety devices that we have in our home. It makes sense that kids wake up to a voice easier than an alarm. We have a heavy sleeper! Scary. Hmm, interesting that they want you to put detectors on levels of the home without anything that would give off CO. I’m assuming it is just to be extra safe but also I wonder if it is overkill and recommended by the company itself to sell more detectors. Carbon monoxide poisoning is the number one cause of accidental poisoning in the United States! Everyone needs to have a smoke & carbon monoxide detector in their homes. The more detectors, the better! I noticed this on my own. 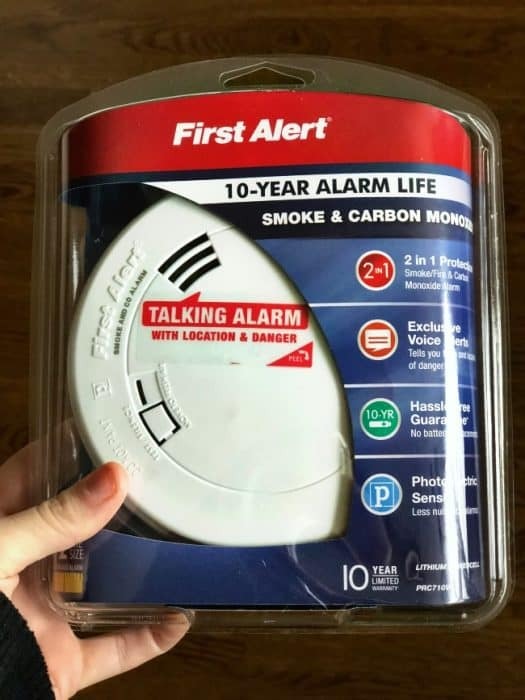 We had the alarms of the house go off because they needed maintenance and my 6 year old never woke up even though it was blaring for a good 5 minutes.Good to know voiced alarms are now made! I was very surprised to learn kids wake up more easily to a voice than an alarm. Thanks for that information. I thought it was interesting that its “older” children that don’t wake to alarms, I would have thought we were safe now that our youngest is 7. This fact is very interesting: According to the Journal of the American Medical Association, carbon monoxide poisoning is the number one cause of accidental poisoning in the United States and is responsible for an average of 450 deaths and more than 20,000 emergency room visits each year. This is why we all need to have a few of these alarms in our home. I also find it scary. I like sudies like this. I never gave thought to my son not waking up to the sound of our smoke detector. This makes sense though. Thank you for a great article. i was shocked to read about the mom and boy who died from CO poisoning in a hotel room, from being above a heated pool. So scary!! I find it crazy (and scary) too that kids don’t wake up…However, I experienced this first hand. We had one go off for no apparent reason in the middle of the night and our three children slept right through it! That kids don’t wake up to alarms like they do to voices. the fact that nearly HALF of Americans report not having CO alarms in their homes. is this due to lack of knowledge for need, expense, not thinking it’s really that important…? Running kitchen vents or exhaust fans while cooking was a new on for me. I didn’t know that CO poisoning was the number one cause of accidental poisoning deaths – very scary, especially with little ones! I found it very interesting that children in the 6-10 year-old age range do not easily wake to an audible alarm. It is reassuring to know that units with voice alerts are now being manufactured and sold. I was surprised to hear that the child and mother died because their room was above a heated swimming pool at a hotel. How scary! I had never heard about running the vents while cooking! I know first-hand the value of these arms-it saved my roommates life about 15 years ago! I was surprised to learn that CO poisoning causes an average of 450 deaths and more than 20,000 emergency room visits each year. I was also surprised when my own units started beeping because they had “expired” and have a rather short life span.